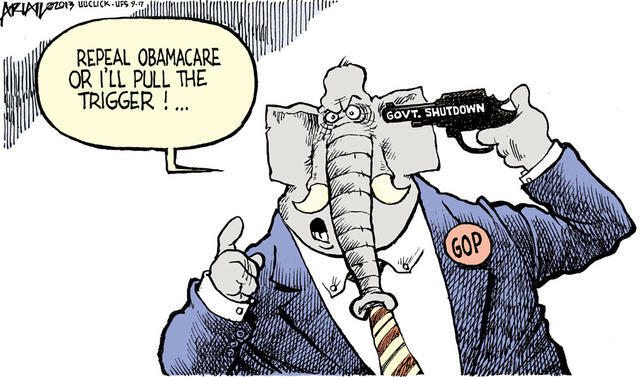 The mainstream GOP is so certain Republicans will be blamed for the government shutdown, the first in 17 years, it has been actively campaigning against its conservative base within government. Sen. John McCain summed up the party line when he said that as much as he doesn’t like Obamacare, it’s the law, and shutting down the government won’t change that. But the tea party has leverage over House Speaker John Boehner, who was nearly fired from that position, and Boehner has leverage over his caucus. Thus the House has refused to vote so far on any bill to fund the government unless some token strike against the Affordable Care Act is included. Republicans inched toward resolution Monday, first settling for a delay of the individual mandate and then attempting to negotiate their differences in conference, but it was too little too late and the maneuvering was not enough by the stroke of midnight. So 1.8 million government employees will either stop working or work without pay. Here’s the rub: As with the sequester, President Obama is the chief executive and, through his subordinates, can shape the impact of the shutdown. For example, the president signed a billensuring that enlisted military personnel will be paid on time. But he hinted Monday that veterans could be impacted through the shutdown. Certain emergency services and programs will stay available—Social Security checks will go out, the president promised—but there will be across the board inconveniences and real human suffering. This is no game, but Obama will have an opportunity to control how the public experiences life without government. Put more accurately, the president will, more than any individual (except for Boehner, whom Senate Majority Leader Harry Reid blamed for the crisis), have the power to decide what kind of government Americans have. Leaders in both parties are scrambling to present as the more reasonable negotiator in this political impasse. Since he came into office, the president has had nothing but opposition from Congress. It shouldn’t be too hard to pin this one on the GOP, given that history and the almost prideful stance political figures such as Sen. Ted Cruz, R-Texas, have adopted in championing the shutdown. It’s their idea, and they’re proud of it. Faced with plummeting poll numbers, a sick economy and an NSA spying scandal that won’t go away, this is quite a gift Obama has received from the opposition. This entry was posted in Barack Obama, Democratic Party, economy, government, politics, Republican Party and tagged Affordable Care Act, government shutdown, Harry Reid, John Boehner, John McCain, Obamacare, Peter Scheer, Ted Cruz, Truthdig. Bookmark the permalink.